How can we describe Medieval Scrolls? Each scroll in our database exhibits its own distinctive physical and thematic features. Looking across all of the data, however, patterns do emerge among rolls sharing similar characteristics. Viewing scrolls according to these categories enables greater depth of analysis and more specific research. Scrolls in the database have been grouped into twenty-two categories based upon their content and likely function. Descriptions of these categories and suggestions for additional reading on each can be found below. Amulet rolls distinguish themselves as written objects that function without the act of reading. Though they contain writing, these rolls are intended to be worn or carried in order to deliver their owner from evil such as disease or demons. One common use of amulets was in the form of birth girdles designed to aid in childbirth. The content of these rolls could include prayers, charms, magical images, lives and images of saints, and copies of the psalms. Amulet rolls do not have consistent dimensions. Some are meters long and others are only as long as ten centimeters. This variation is due to the fact that these rolls are often meant to be transported tightly rolled in special capsae (containers, sing. capsa). Amulet rolls were used across Europe and were written in Latin as well as vernacular European languages. The amulet rolls in our database span the 13th to the 17th centuries. Stork, Hans-Walter. “Spätmittelalterliche Gebetsbücher in Rollenform in Überlieferung Und Bild,” Gutenberg Jahrschrift 20 (2010): 43–78. Skemer, Don C. Binding Words: Textual Amulets in the Middle Ages. Magic in History. University Park, PA: Pennsylvania State University Press, 2006, 214-217, plate on p. 214. Skemer, Don C. “Amulet Rolls and Female Devotion in the Late Middle Ages,” Scriptorium 55 (2001): 197–227. These rolls contain information for record keeping as well as commemorating spectacles and official events. Some records took on additional importance simply due to their roll format. Examples include the marriage certificate of 10th century Byzantine Empress Theophano and the Swan Roll of Norfolk, a record of the owners of each swan in the Broadland Area of England. In medieval England, two types of archival rolls, Exchequer scrolls (made of several stacked and attached sheets that are subsequently rolled) and Chancery scrolls (sheets attached end to end) were very popular. The materials being recorded were usually legal or financial. Archival rolls still survive today in very large numbers. They are not recorded in this list, except for unusual items. Marks, Richard, and Paul Williamson. Gothic: Art for England 1400-1547. London: V&A, 2003. Skemer, Don C. “From Archives to the Book Trade: Private Statute Rolls in England, 1285-1307,” Journal of the Society of Archivists 16 (1995): 193–206. Ticehurst, N.F. “The Swan-Marks of West Norfolk,” Transactions of the Norfolk and Norwich Naturalists’ Society 12, no. 5 (1929): 581–630. Calendar rolls are a category of scrolls containing organized depictions of the days of the week or the days of each month. Along with their primary function of displaying calendrical data, these rolls often exhibit a secondary purpose. Some rolls include astronomical tables or almanac information. Others use their calendars for prognostication about future events. As a result of these characteristics, some calendar rolls read horizontally rather than vertically. This atypical orientation could result from aesthetic rather than practical considerations. The calendar rolls within the database span the 13th to 16th century and appear in Latin, Dutch, and Middle English. Bühler, Curt F., “Thunder Books Again,” Res Publica Litterarum. Studies in the Classical Tradition I (1978): 1–5. Chronicling the past was a common function for scrolls in the Middle Ages. These rolls describe a succession of events or persons in one or multiple timelines. 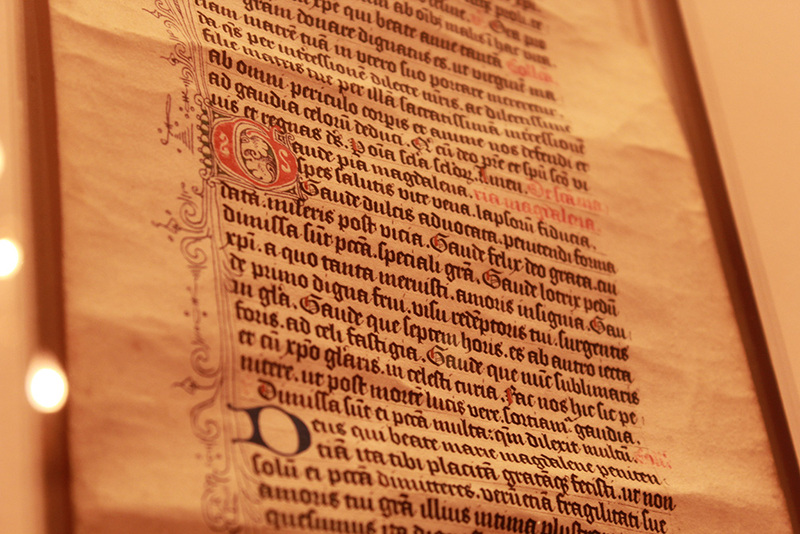 The scroll is an excellent writing format for such documents, communicating information without page breaks and allowing future information to be easily added to the end of the roll. Chronicle rolls are among the longest scrolls and many contain illustrations alongside their text. Lists of popes and emperors abound among these rolls. Chronicle rolls in the database have been dated from the 11th to the 16th century and appear in German, Latin, French and English. One form of chronicle roll notable for its lavish illustration and large size is the World Chronicle Roll. These scrolls give a history of the entire world which usually begins at Genesis and ends in the year in which the scroll was created. They typically reference important biblical events such as the Great Flood and the Nativity as well as historical events such as the Fall of Troy and the Empire of Charlemagne. Most World Chronicle Rolls demonstrate a genealogical lineage of the region’s current rulers alongside of the important biblical figures such as Adam and Eve. The largest World Chronicle Roll is 1775 cm long and 65 cm wide. World Chronicle Rolls are typically found in Latin or French. None are dated before the 15th century. Davis, Lisa Fagin. La Chronique Anonyme Universelle: reading and writing history in fifteenth-century France. London: Harvey Miller Publishers, 2014. Scrolls classified as Dramatic Parts are those containing plays and actors’ roles. They are identified not by their physical characteristics but rather by the content of their text. Various medieval plays are represented in these rolls with some containing the parts of all characters of a play whereas others only have a portion of a larger work. The function of scrolls with dramatic parts is unclear. Among other possibilities, these rolls could have been used as a portable and lightweight tool for rehearsal or as concealed cheat-sheets in case an actor or actress forgot his or her lines during a performance. The rolls represented here are written in various languages and come from the 13th to the 16th century. Lalou, Elizabeth. “Les Rolets de Théâtre: Étude Codicologique.” In Actes Du 115e Congrès National Des Sociétés Savantes, Avignon, 1990, 51–71. Paris: Editions du CTHS, 1991. Ranke, Friedrich, ed. Das Osterspiel von Muri, Nach Den Alten Und Neuen Fragmenten Herausgegeben. Aarau: H.R. Sauerlander, 1944. Ecclesiastical rolls, as their name indicates, are scrolls which primarily contain Church matters and records. The Ecclesiastical Rolls in the database, which span the 10th through the 14th century, contain various materials such as the elections to bishoprics, lists of relics, notes from Church councils, and codes of Canon Law. Utilizing the format of the scroll to keep records certainly held some significance for the Church. One potential effect of keeping Church records on rolls is that they serve an archaizing function in that they connect the present document written in roll format with the previous centuries of the Church when the scroll was the primary writing medium in use. See also Liturgical. Two types of Royal Genealogical Rolls are found in numbers significant enough to warrant their own categories among all other Medieval Scrolls, French and British Royal Genealogies. These rolls trace the lineages of British and French kings from a variety of different starting points ranging from Adam and Eve to Saxon lords. Many of these rolls contain elaborate illustrations of parallel familial genealogies covering centuries of history. Genealogical rolls can be very long, spanning multiple meters, and are one of the most common forms of Medieval Scrolls. The medium of the scroll is ideal for emphasizing unbroken lines of succession and for adding additional sections to the document, should the need arise. The text of these rolls, which may be written in Latin, French or English, is often written around roundels containing images of rulers. Anglo, Sidney. The British History, in Early Tudor Propaganda. Manchester: John Rylands Library, 1961. Tyson, Diana B. “The Manuscript Tradition of Old French Prose Brut Rolls.” Scriptorium 55 (2001): 107–18, BL4. Heraldic Rolls or Rolls of Arms are one of the most beautifully illustrated forms of Medieval Scrolls. These rolls document and display the familial coats of arms for noble families. This heraldry may or may not be accompanied by text explaining the imagery or naming the houses. Heraldic Rolls highlight the capacity of the scroll to enhance the ceremonial value or the importance of the text. London, H. S. Rolls of Arms of Henry III. Oxford: University press for the Harleian Society, 1967. Wagner, Anthony. A Catalogue of English Medieval Rolls of Arms. Aspilogia 1. Woodbridge, Suffolk: Boydell Press, 2009, 14-16. Liturgical Rolls contain the prayers and instructions for ecclesiastical liturgies and rituals. Some of these formulations can be found elsewhere in codex form while others cannot. Pontifical rolls, for example, represent unusual manifestations of a text which is more often recorded in a codex. It is unclear why the creators of such rolls would elect to write a roll form of the text rather than a codex. Some Liturgical Rolls, such as Exultet rolls, have only been found in scroll form. These elaborately decorated rolls contain the Exultet hymn, which traces Salvation History and which is traditionally sung only during the Catholic Easter Vigil Liturgy. Undoubtedly, the scroll was the only medium deemed suitable for Exultet hymns, but the reason as to why is up for debate. Liturgical Rolls can be found both in Greek and in Latin as well as in other Western European languages and range from the 10th to the 16th centuries. Cavallo, Guglielmo, Giulia Orofino, and Oronzo Pecere, eds. Exultet: Rotoli Liturgici Del Medioevo Meridionale. Roma: Istituto poligrafico e Zecca dello Stato, Libreria dello Stato, 1994. Kelly, Thomas Forrest. The Exultet in Southern Italy. New York: Oxford University Press, 1996. Suski, Andrzej Wojciech, Giacomo Baroffio, and Manlio Sodi. “Rotoli Liturgici Medievali (Secoli VII-XV). Censimento E Bibliografia.” Rivista Liturgica 101, no. 3 (2014): 603–21. These rolls encompass both scrolls which provide directions and instructions for reaching destinations as well as informational geographic maps. Among such rolls are Pilgrimage rolls. These particular map rolls had a two-fold purpose: on the one hand, these rolls served as a sort of pious adventure story, telling the tale of a pilgrim’s journey to a holy site and his overcoming of the trials that took place on the way. On the other hand, these rolls are guides which give geographical and directional information to assist would-be pilgrims on their own journeys. Other kinds of rolls, Mirabilia Romae, in this category list wondrous or important sites within specific cities such as Rome. The rolls in the database are written in Latin and French, and they exist in a variety of dimensions. Bosio, Luciano. La tabula peutingeriana. Rimini: Maggioni, 1983. McCormick, Michael. Charlemagne’s Survey of the Holy Land: Wealth, Personnel, and Buildings of a Mediterranean Church between Antiquity and the Middle Ages: With a Critical Edition and Translation of the Original Text. Dumbarton Oaks Medieval Humanities. Washington: Dumbarton Oaks, 2011. Medical and Alchemical Rolls concern themselves with subjects of anatomy, medicine, and alchemy. Often they employ complex diagrams and elaborate illustrations to communicate information to their audience. One roll, Bodleian Library MS Digby Rolls 4, contains an elaborate drawing of the palm of a hand upon which important elements of palmistry are superimposed. In the case of such rolls, the choice of the scroll as the support for writing was surely chosen to enhance the appearance of these documents as authoritative or ancient. A similar phenomenon occurs within the famous Ripley scrolls based upon the work of the 15th century English alchemist. The Medical and Alchemical Rolls in the database are typically English in origin. They originate between the 11th and 16th centuries. McCallum, R. Ian. “Alchemical Scrolls Associated with George Ripley,” in Mystical Metal of Gold, edited by Stanton J. Linden, 161–88. New York: AMS Press, 2007. McCallum, R.Ian. “The Ripley Scroll of the Royal College of Physicians of Edinburgh,” Vesalius 2 (1996): 39–49. Price, Derek J. An Old Palmistry, Being the Earliest Known Book of Palmistry in English. Edited from the Bodleian Ms Digby Roll IV, Cambridge: W. Heffer, 1953. Mortuary Rolls were created in response to the death of an abbot, abbess, bishop or other esteemed member of a religious community. The roll documented the death and was circulated by a courier to other monastic communities or churches in the region. Once it received a Mortuary Roll, a community would pray for the deceased and add a list of their own recently departed brethren to the end of the roll, adding a new membrane if necessary. The roll thus might grow in length as it traveled. There are over 170 Mortuary Rolls and fragments cataloged in the database mostly originating from French, English or Italian religious communities. The longest of these rolls is almost 13 meters in length. These rolls date from the 9th century to the 16th century. Dufour, Jean. Les rouleaux des morts. 4 Vols. Monumenta Palaeographica Medii Aevi. Series Gallica. Turnhout: Brepols, 2009. Music Rolls are so named because they contain musical notation and the performance of music is their principal function. These scrolls are distinct from Liturgical Rolls because their content is not specifically liturgical in nature. Music Rolls in the database date from the 13th to the 15th century and contain compositions in German, Latin, French and English. Kügle, Karl. “Two Abbots and a Rotulus: New Light on Brussels 19606.” In Quomodo Cantabimus Canticum? Studies in Honor of Edward H. Roesner, edited by D.B. Cannata, G. Ilnitchi Currie, R.C. Mueller, and J.L. Nádas, 145–85. Middleton, WI: American Institute of Musicology, 2008. Hoppin, Richard H. “A Musical Rotulus of the Fourteenth Century,” Revue Belge de Musicologie 9 (1955): 131. Hohler, Christopher. “Reflections on Some Manuscripts Containing 13th Century Polyphony,” Journal of Plainsong and Medieval Music Society 1 (1978): 2–38. Poetry Rolls are those scrolls which hold poetic content. The choice to write down poetry in a scroll rather than in a codex or on a single sheet of material is an interesting one. Poets are often depicted holding scrolls, perhaps so as to be able to recite with reference to a small prtable document. Scrolls also offer poets creating a new piece (indeed, to any writer) the luxury of an indefinite length. The longest scroll in the database stands at 182 centimeters. A few of the scrolls in the database contain a collection of poems, rather than one single piece. Interestingly, one of these scrolls, British Library add MS 23988, displays several poems in different hands written on both sides of the scroll. This would suggest that the scrolls was shared among various individuals who would utilize the format of the scroll to add on new poetry to the existing document. Poetry Rolls in the database span the 12th to the 15th centuries and are written in English, Latin, French and German. Schröbler, Ingeborg. “Zur Überlieferung Des Mittelateinischen Gedichts von ‘Ganymed Und Helena.’” In Unterscheidung Und Bewahrung. Festschrift Für Hermann Kunisch Zum 60. Berlin: Walter de Gruyber, 1961, 321-330. Prayer Rolls are so named because their main contents take the form of prayers. These scrolls are distinguished from Liturgical Rolls by the fact that Prayer Rolls were used in private spiritual practice rather than in a public liturgy. Likewise, Prayer Rolls are not considered to be Amulet Rolls because their efficacy rests in the recitation of prayers and not the transport of the scroll itself. Prayer Rolls hold many types of prayers including pleas for the intercession of particular saints, penitential psalms and litanies, and prayers to be said at certain holy sites. One important group of Prayer Rolls are the Arma Christi (lit. “weapons of Christ”) rolls which contain prayers in verse praising each of the wounds of Christ’s Passion. The most common of these is the “O Vernicle” prayer praising Christ for his suffering and asking for protection from sins. In addition to their prayers, Arma Christi rolls also serve multimedia functions. Some of these rolls are measured to be the length of Christ’s body and most contain illustrations with images of the weapons used to wound Christ. Just as the length of the Arma Christi roll reflects Christ’s body, so too the images of weapons are drawn to scale. Most Arma Christi rolls come from the 15th and 16th centuries and are typically written in English verse, though they may also be found in Latin and Dutch. Prayer Rolls as a whole originate from the 14th and 15th centuries and are written in Latin, Dutch, French, and English. Cooper, Lisa H. and Andrea Denny-Brown, The Arma Christi in Medieval and Early Modern Material Culture. Farnham: Ashgate, 2014. Collins, A. J. “A Book of Hours in Roll Form,” The British Museum Quarterly 4, no. 4 (1930): 111. Drimmer, Sonja. “Beyond Private Matter: A Prayer Roll for Queen Margaret of Anjou,” Gesta 53, no. 1 (2014): 95–120. Some scrolls contain recipes for the preparation and cooking of food. These Recipe Rolls can hold over a hundred recipes for sauces, meats and other dishes. The medium of the scroll is useful for such documents in that it allows for the easy addition of new recipes as they are discovered as well as the easy portability of the scroll. There are some drawbacks for the use of the scroll for a document concerned with cooking, though. First, the entire length of the scroll must be unrolled in order to locate the desired recipe each time one wishes to employ the scroll. Second, the scroll would likely have needed to be held in place while a recipe was referenced by a cook in order to avoid the scroll rerolling itself and hiding the desired information. Perhaps it is due to these drawbacks that there are only a few extant Recipe Rolls. The Recipe Rolls in the database come from the 13th and 15th centuries and are written in French and English. Hieatt, Constance B., and Sharon Butler, eds. Curye on Inglysch: English Culinary Manuscripts of the Fourteenth Century. Oxford: Oxford University Press, 2013. A Trees of Christ, or Genealogia Christi, explains the ancestry of Christ to readers either through a list of names or by a series of genealogical images. The physical nature of the scroll demonstrates one continuous unbroken lineage of Christ. One particular form of these scrolls is noteworthy, the Compendium Historiae of Peter of Poitiers (Petrus Pictaviensis) composed in the 12th century. The Compendium contains a series of drawings designed to assist unlearned clerics with the remembrance of biblical history and the genealogy of Christ. Trees of Christ can be found dating from the 12th to 16th centuries. Most are written in Latin. Cahn, Walter. “The Allegorical Menorah,” in Tributes in Honor of James H. Marrow: Studies in Painting and Manuscript Illumination of the Late Middle Ages and Northern Renaissance, edited by Jeffrey F. Hamburger and A. S. Korteweg, 117–26. London: Harvey Miller, 2006. Monroe, William H. “A Roll Manuscript of Peter of Poitiers’ Compendium,” The Bulletin of the Cleveland Museum of Art, no. 65 (1978): 92–107. Moore, Philip S. The Works of Peter of Poitiers, Master in Theology and Chancellor of Paris (1193-1205). Notre Dame, IN: The University of Notre Dame, 1936. Varia Rolls are scrolls which do not fit into other category. These scrolls have no unifying characteristics, but their uniqueness makes them fascinating. Some of the scrolls listed as Varia Rolls in the database include a swordplay instruction scroll, a scroll predicting the future, and a scroll documenting New Year’s gifts for the Queen of England. Vitae Rolls are scrolls which record the lives of saints. These scrolls usually contain illustrations depicting scenes from the saint’s life alongside a narrative text. They can be oriented either horizontally or vertically, and they can be either very long or very short. Vitae in the database are found in the 11th through 14th centuries. Most are composed in Latin. Branner, Robert. “The Saint-Quentin Rotulus,” Scriptorium 21 (1967): 252–60. Buccolo, Marco. “Un antico antifonario sul verso del Rotulo di San Teobaldo,” Alba Pompeia 10 (n.d.): 82–90.